While this hypothesis is coming true for the broader market, the Biotech sector has lagged. Since biotechnology’s steep 40% decline from 2015 highs, as represented by the ETF IBB, the sector has staggered and recovered only 7% from its low of 240 to a close of 256 as of March 21. 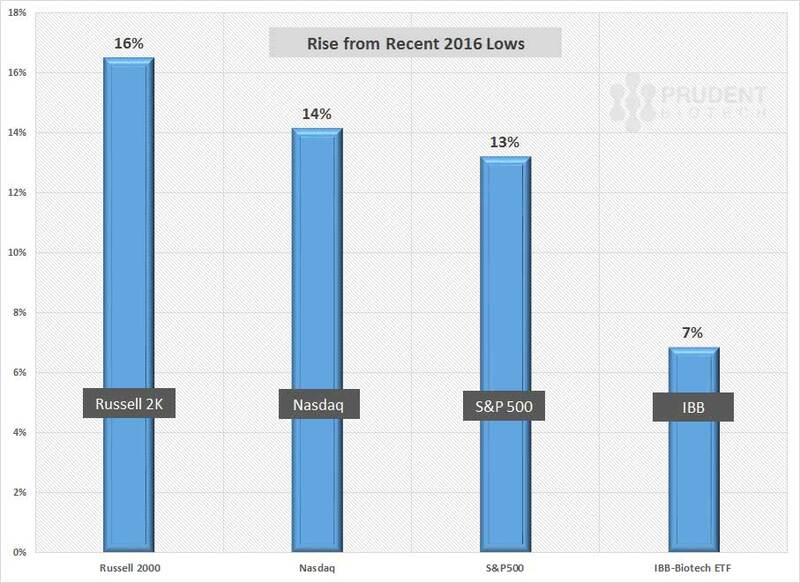 As can be observed from the chart below, this performance considerably lags those of broader market indexes like Nasdaq and the S&P 500, and significantly lags that of more speculative indexes like the small cap Russell 2000. In a recent article, and related articles on our blog, we had discussed the biotechnology sector appearing to have bottomed-out. However, it has not yet shown any upside momentum, compared to broader market indexes. There are a variety of reasons for the lagging performance and we believe most of these will no longer be dominant going forward, allowing for the sector to move higher. As the Federal Reserve shifted its interest rate policy in December 2015, and then in January this year indicated a pace of four rate hikes for 2016 implied by its dot plot, as well as reinforced by comments made by the Federal Reserve Vice Chairman, the analyst community began adjusting (raising) the discount rates used in the valuation models and consequently revising down the price targets over January and February. This contributed towards creating broad-based pressure on the biotechnology group, particularly the midcap and small cap segments which in the absence of earnings for many out-years are highly sensitive to discount rates. However, by late February and early March, the market began to accept a more moderate pace of interest rate increases. This was borne out during Federal Reserve's decision at the March 16 meeting to reduce the median interest rate target for year-end 2016, thus implying the number of quarter-point rate hikes to be 2 from the earlier 4. The slower pace of interest rate increases has contributed towards meaningfully lifting the blanket of pressure off the entire market. A more settled interest rate environment with a moderately rising interest rate curve, attendant with lower market volatility, allows for the discount rates in the biotech valuations to remain steady. This will provide a reassessment of risk in the biotech sector, and we believe should be favorable to rising valuations in the coming months. The IBB ETF has underperformed key indexes, and it will be helpful to look at the constituents of the underlying index whose performance it tracks - the Nasdaq Biotechnology Index ("NBI"), a capitalization based weighted index. The large cap segment, that is stocks above $10 billion market capitalization, comprised 12 stocks, out of a total of 191 stocks, and accounted for ~62% weight in IBB. The remaining stocks, the mid caps and small caps, accounted for the remaining 38% weight. 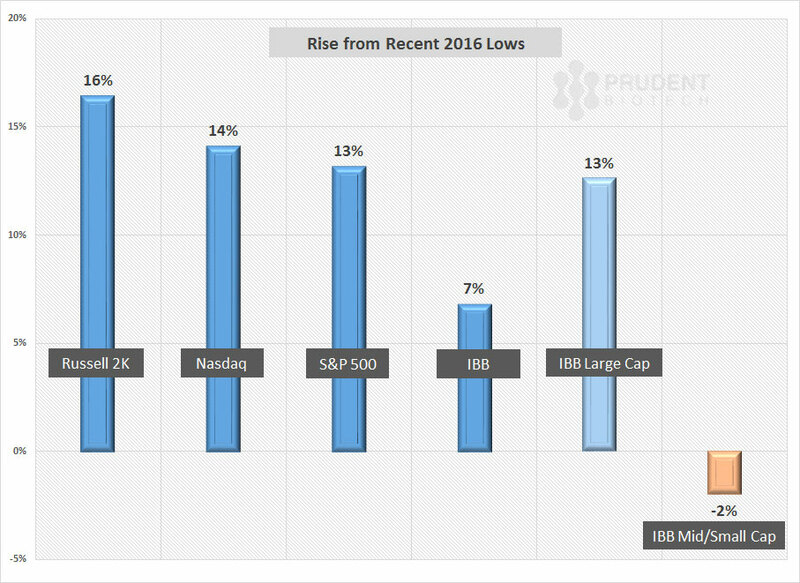 As can be viewed from the chart below, the large cap segment of Biotech Index had an average return of 13% from recent lows, thus keeping pace with the returns of the broader market represented by the Nasdaq and S&P. Clearly, the large cap biotech segment has significantly outperformed the mid cap and small cap segments of the index. Just mathematically, for IBB to return 7% for the year so far, the contribution from the mid cap and small cap segment of the index (with the 38% weight) had to be a negative return of ~-2%. This is an interesting deviation, considering that the Russell 2000 index, a broad-based small cap gauge, was one of the strongest performers during the period with a return of 16%. We believe, the relative underperformance of biotech's lower cap segment is directly related to a shrinkage of risk appetite, and the rising discount rates being used in valuations of small cap and mid cap biotech stocks. 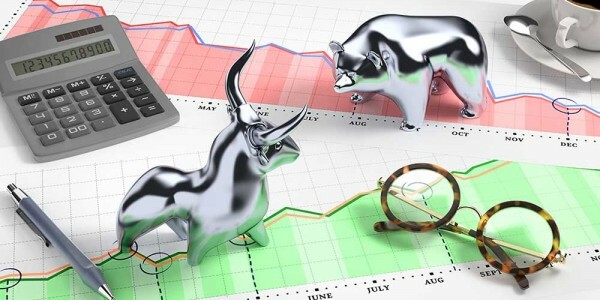 However, with diminished volatility, as being conveyed by VIX, a drift towards risk-taking, as being conveyed by the Russell 2000 index, and a relatively settled interest rate situation, discussed above, we believe the midcap and smallcap Biotech segments are now ready to participate in the rally from their lows as well. The Valeant (VRX) saga has been an albatross around the sector's neck, as continuing bad news turned worse. The earnings call this month demonstrated how Valeant continues to float rudderless as it attempts to steady its business. However, the announcement of a change in management was perhaps the pivotal news required to stem such confidence erosion both in the company and the healthcare sector. We believe till Valeant acquires new leadership it will continue to have an adverse impact on the biotech sector, but with a diminishing influence which will thus be favorable for the sector. Finally, the healthcare sector has been affected by the political undercurrents and the headlines towards managing high drug costs. This is an issue which will remain prominent during an election year, and the biotech sector will have to see it through. It may be an issue that can be tough to shake off, as congressional hearings keep the issue visible. But in the absence of a clear path for bipartisan support in Congress, the issue may just remain a minor drag for now and chip away at a few points of performance. We believe this issue will soften its hold as the year goes along. The recent decision by Center for Medicare and Medicaid Services to cap payout to health care providers, and the FDA decision to speed up review of generic applications for single proprietary drug, are of the same cost-control nature. The buildup of activity in the IPO and secondary market for the Biotechnology sector will be a very favorable sign of growing confidence in the sector's prospects. Ability to finance in the stock and debt markets is highly critical for biotechs, which have limited access to other sources of financing like bank loans. Improvement on this front will bolster valuations. In addition, lower valuations may invite consolidation interest, and if that materializes then it can further strengthen confidence and even create the potential for a sector-wide spurt. 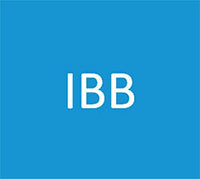 An informative article about IBB from a Seeking Alpha contributor Ed Wijaranakula can be read here. So far this year, we have remained cautious on the sector in our Prudent Biotech portfolio which was up 1% compared to IBB decline of -25% for the first two months of 2016. It is our belief that the clamps on the biotech sector are loosening, and the sector is poised to move higher and benefit from a shift towards risk-taking. This doesn't mean a straight-ride up, but a favorable trend. Well-capitalized midcaps and smallcaps should be the more prominent beneficiaries, but of course one cannot fault a bias towards large cap names like Gilead Sciences, Amgen, Illumina and Biomarin to name a few. To raise exposure to the sector, a basket of biotech names should be considered. There are many promising candidates in mid cap and small cap segments like Medivation (MDVN), Ionis Pharmaceuticals (IONS), Seattle Genetics (SGEN), Neurocrine Biosciences (NBIX), Juno Therapeutics (JUNO), Intrexon (XON), Prothena (PRTA), Dynavax Technologies (DVAX), and Omeros (OMER), to name a few. But the nature of Biotech is full of promise and pitfalls, and one can encounter bumps in promising names too like Eagle Pharmaceuticals (EGRX), Portola Pharmaceuticals (PTLA), and Celldex Therapeutics (CLDX), to name a few. Consequently, we reiterate a prudent portfolio approach as there are no guarantees in biotechs. As always, do your own diligence. This is our opinion as of now, and any unforeseen market conditions may make us reconsider and revise our viewpoint, particularly a breakdown of recent lows in IBB. The article for first published on Seeking Alpha and can be viewed there.